CPS has proven itself to be fiscally irresponsible and reckless with limited tax dollars. Chicago students deserve better. Even without the new revenue proposals put forth by the Chicago Teachers Union, CPS can stop wasting money on expensive contracts that produce shoddy services. Promoted as a cost-savings move, the Chicago Public Schools outsourced the management of school nurses to an east coast company with defense contracts in the summer of 2015. 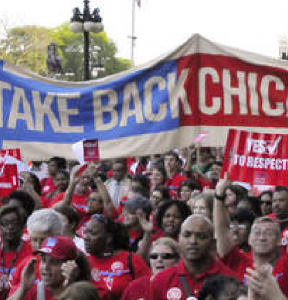 Six months into this four-year contract, nurses from the Chicago Teachers Union report on the drastic failure of this company to meet its contractual obligations, putting nearly 400,000 Chicago students in danger. Charter schools promote a culture of competition rooted in business practices, but not “free market” competition as charter school boosters would have us believe. The city of Chicago has been good to Jerry Reinsdorf. Support from a large fan base has helped Reinsdorf transform the Bulls and White Sox into two of the most successful sports franchises in North America, with a combined value of $1.2 billion and over $70 million in total annual operating income as of 2012. This report offers a case study in why calls for increased accountability need to be directed at the corporate profiteers who make it impossible to equitably fund local public education, instead of at hard-working and dedicated teachers. 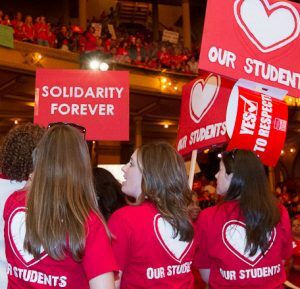 The Chicago Teachers Union exposes the falsehoods and inequities created by an education policy that, rather than being held publicly accountable, is controlled by the profit-minded corporate community.